Did you know that there are only 5 more Fridays until Christmas? It’s fast approaching so I figured it was time get going on some of my holiday crafts. 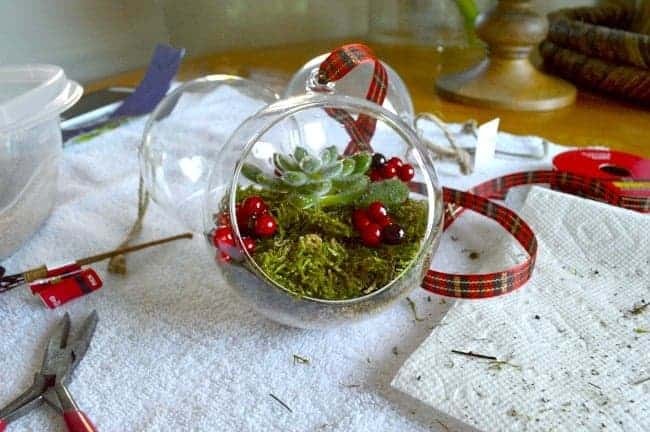 I’ve been into succulents this year, because they seem to be the only plant that I can keep alive in my house, so I thought my first craft of the season would be to make live Christmas ornaments for the tree. 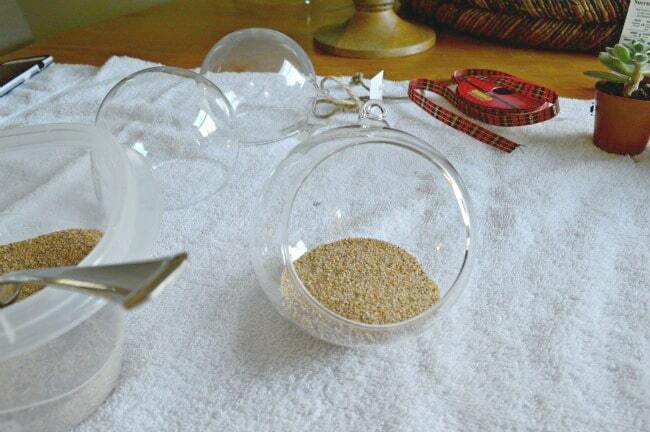 I began by adding a small amount of sand to the glass ball,to give the succulent a base. 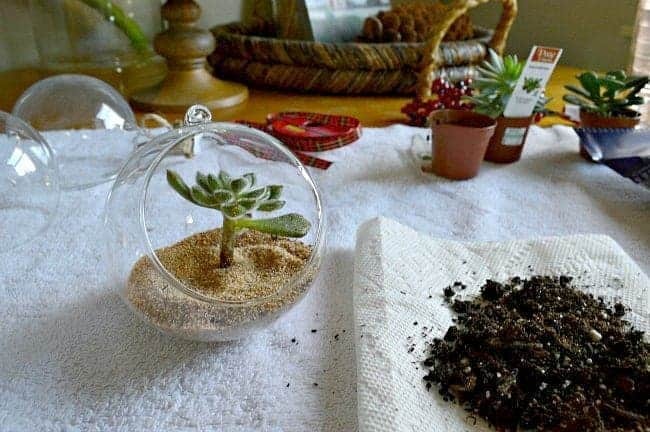 Next, I removed the petite succulent from its pot, carefully removed all of the loose soil and placed it in the sand in the glass ball. I took a few pieces of the sheet moss and lightly sprayed it with water, to soften it up. 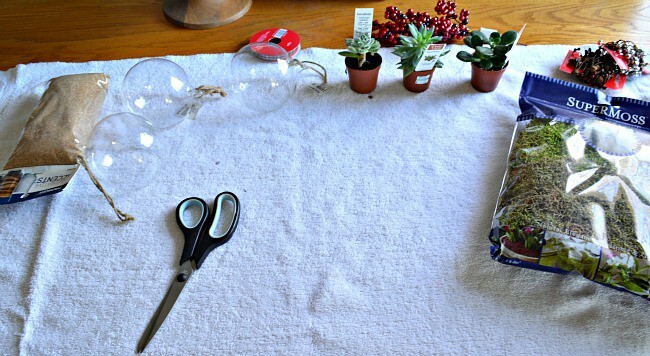 Then I carefully placed the pieces around the succulent. 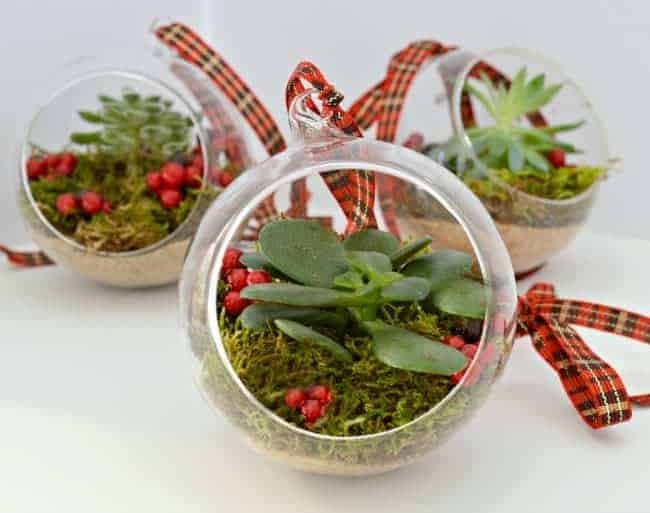 I used sheet moss to add more green (for Christmas) to the ornament but you could add some stones or other filler. After the moss was in place, I took my faux berry stem, clipped a few bunches off and placed them around the succulent. To finish it off, I added a ribbon and my first live Christmas ornament was complete. So, I would have liked to show a picture of them hanging on our tree, but I’m not ready to put it up yet (as a blogger, is it ok to admit that?). Anyway, I arranged them on my marble pedestal with some greens that smelled like Christmas, and called it a day. They’re all ready to hang when I do decide to put the tree up. I made these about a week ago and I’m happy to report that they are still alive and well. How about you? Are you ready to start decorating for the holidays or is it way too early? Can you tell me how to best care for them after assembled? 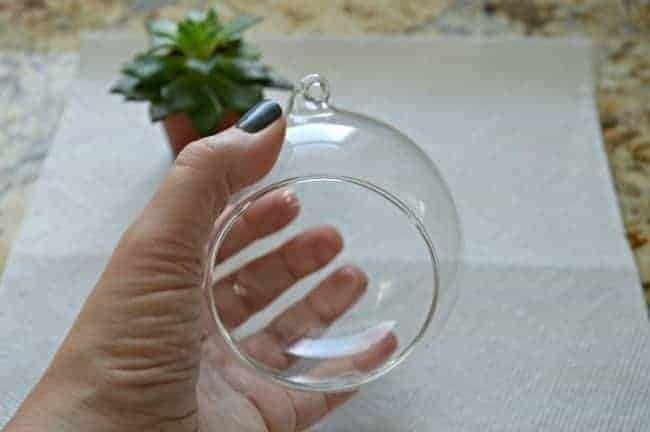 I’m making some as Christmas gifts this year and want to pass on care instructions. Hi Ktisti. 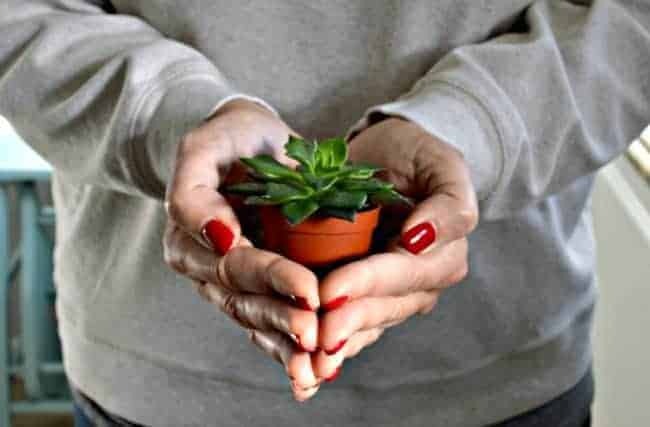 I just stopped by via Second Chance to Dream I love your Christmas Ideas- & I made a Plant gift similar to yours last yr. I did an Air Plant instead of a succulent. Very Nice-no watering -just misting . Hi Karen. 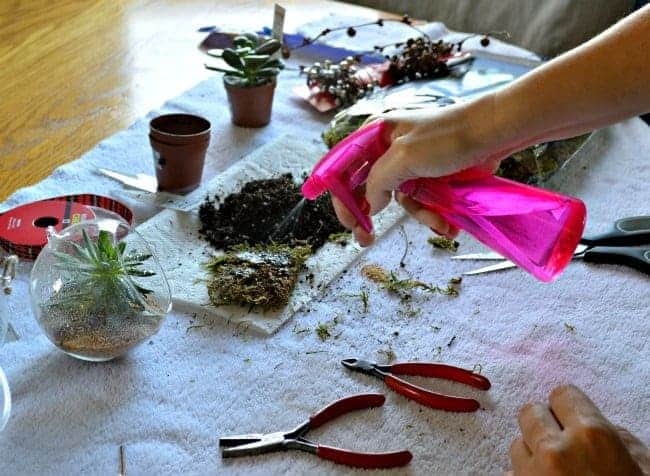 An air plant is a great idea! Thanks for sharing that and for stopping by. Such a fun idea! Pinning and I hope to try and make one this Christmas. It would make such a sweet Christmas gift too:). Thanks so much Tara, I appreciate it. I totally agree, they would make great gifts. I love them so much! Such a great idea. 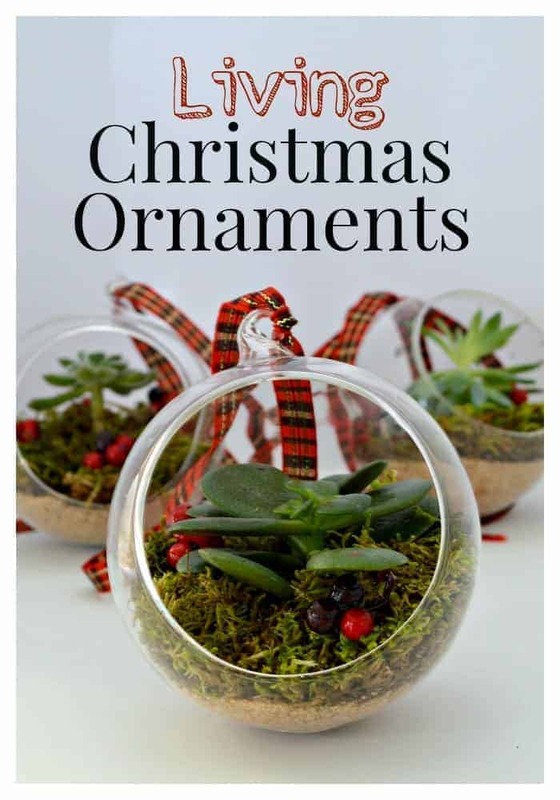 I’m sure when you are ready they are going to look just as pretty hanging from your Christmas tree. Oh, I love these! 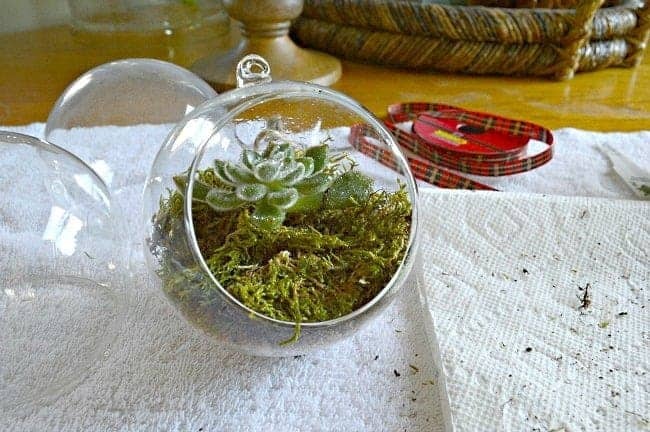 They’re mini terrariums! So pretty and “natural”. I’m imagining something like these on a larger scale. 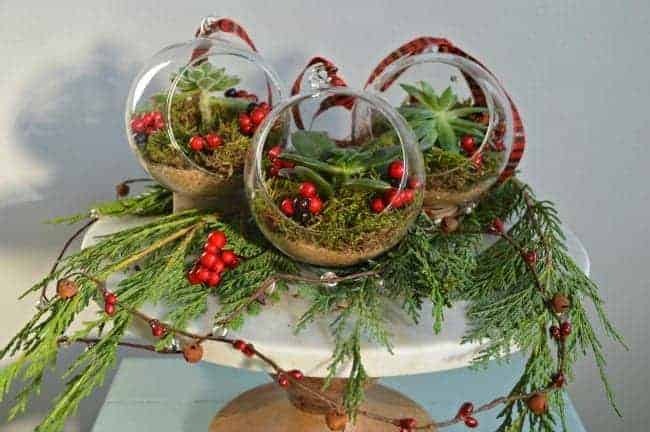 Like a terrarium centerpiece. 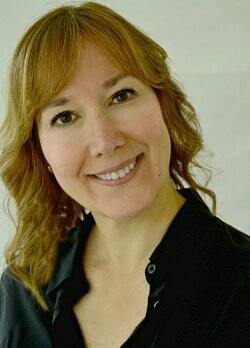 I’m feeling inspired, Kristi. I’m so glad that they inspired you Nancy. There’s so many cool containers out there now to do a really nice, and in my case easy, terrarium. Something like mine, on a larger scale, would look fabulous on your beautiful kitchen window ledge. Oh no Sheila! LOL I’m usually pretty good with plants but the lighting in this house has proven to be a challenge and succulents have been my only survivors. Maybe they could work for you too. Such a cool idea. Do the ornaments are they already cut out like that? Thanks Theresa. Yes, they are already like that. I got mine at World Market. I know, I can’t believe that we are so close to Christmas. I’m having some luck with succulents lately, maybe they would work for you too. You don’t have to have a tree, I think that putting some pine branches in a vase would be great, and would make your house smell good. You can usually get clippings for free from Lowe’s or Home Depot when they start selling trees. Thanks for visiting Debbie. Hope you have a great week! Those ornaments are really beautiful. These are marvelous Kristi! They would make lovely gifts as well!!!! Yes they would Vel, thanks! Oh Kristy! No, no, no! Not yet! I know bloggers are ahead of the season sooo, I’ll cut you some slack. 🙁 I’m not ready yet. I have one rule, no Christmas decorations until after my birthday. My birthday is the first week of December and I just never liked seeing Christmas decor that early. Your Christmas ornament is very cute and I love the way you displayed it! Oh well, that’s the life of a blogger. We start early so that we can share our ideas before readers start decorating. I haven’t even begun decorating yet but I’m having some fun doing a few Christmas crafts (takes my mind off of my unfinished kitchen 😉 ) Hobby Lobby by me started displaying their holiday merchandise in July, just crazy.